This is a sponsored conversation written by me on behalf of Tom Thumb and Albertsons. The opinions and text are all mine. The countdown to Christmas is ticking down and it’s ticking loud. It’s an incredibly busy time but it’s also a magical one. All the decorations, music, parties, and food. So much food! Which personally is my favorite part of Christmas. Which cannot be a surprise considering my life basically revolves around food. Today I am sharing a dressed-up version of one of my favorite desserts, flan! I love flan! Especially cheese flan. Growing up in a Puerto Rican home there was always a flan on the table during any holiday celebration. And, I am super excited about today’s recipe. It’s not your typical flan. It was inspired by my upbringing spent with one foot in Puerto Rican holiday traditions and the other in American ones. When I think of Christmas desserts in Puerto Rico I think of custards and coconut but, when I think of dessert in the U.S. I think of fall spices and cranberries. With this dessert, I combined my two worlds and made Chai Spiced Orange Flan with Cranberry Compote. Yes, it’s as amazing as it sounds! Now that I have presented you with what is probably the most amazing Christmas dessert ever created. Yes, I am aware that is a bold statement but I am standing by it. Let’s talk about surviving the Christmas season. As much as we all love Christmas it’s a crazy busy time of the year. If you are a busy poor planner like me it can get a little overwhelming. There is Christmas shopping, parties, children’s events, decorating, crafting, and cooking. We want it all to be perfect for those we love but, we also need to keep our sanity. I am going to share a tip for surviving Christmas. 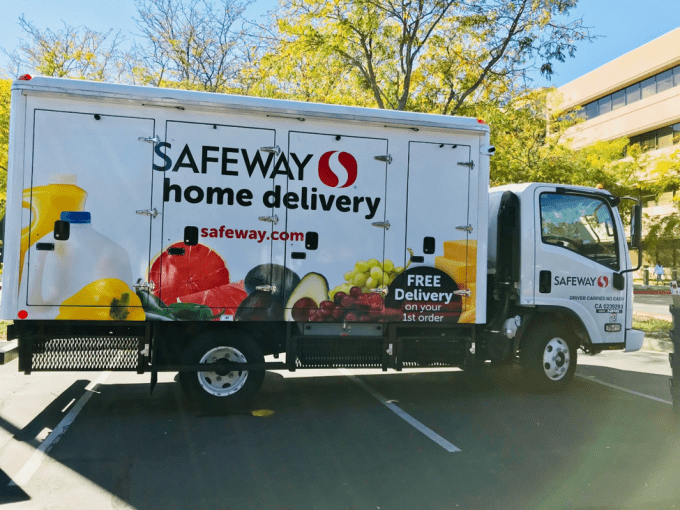 It’s Albertsons and Tom Thumb’s Grocery Delivery service! If you follow me on Instagram you may have seen on my Instagram Stories (If you don’t you should. Just saying.) that I was invited along with other food bloggers to visit Albertsons and Tom Thumb’s Culinary Kitchens and Technical Center. 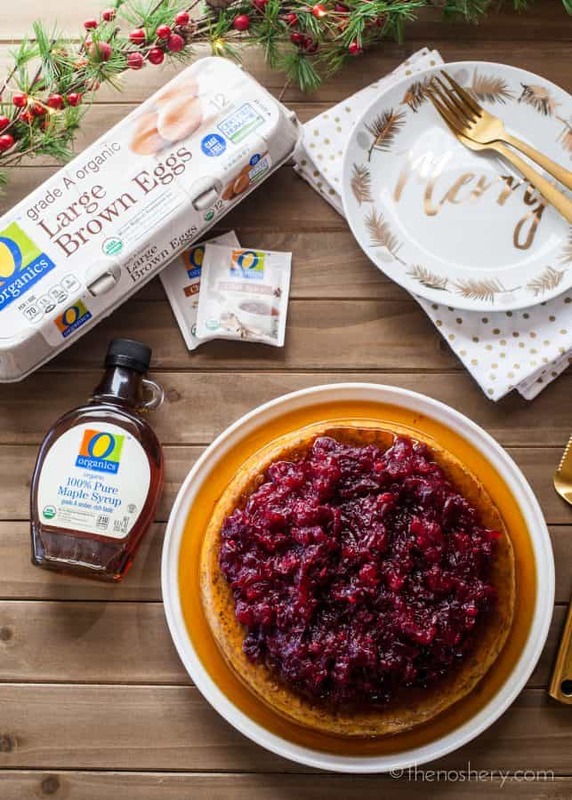 We learned all about Tom Thumb and how to cook with their exclusive products such as O Organics®, Open Nature® products, Signature SELECT™ and debi lilly designTM to create holiday cheer in your home for the holiday season. We also learned about the most magical service, Home Delivery. During our immersive and educational visit, we got to tour their Home Delivery trucks. Most grocery delivery services will drive around with your groceries in bags packed with ice bags or dry ice. Sometimes this means crushed and unevenly cooled product. But Tom Thumb has invested in delivery trucks with temperature regulated compartments. This way it is very unlikely your order won’t be damaged and can be sure that it travels safely. With Tom Thumb grocery delivery, you can shop from the comfort of your home and save shopping lists for easier future orders. And, you choose what day and time works best for you for home delivery or pick-up. It is a lifesaver during the holiday season and I’m a fan of anything that can save me time during this busy time. If you haven’t tried Tom Thumb grocery delivery yet now is a great time! Now until 1/14/18 you can get $25 off + free delivery with a minimum order of $100. Just use the code SEASONSEATINGS at checkout. You can shop all your favorite brands and Tom Thumb exclusive O Organics and Open Nature products. 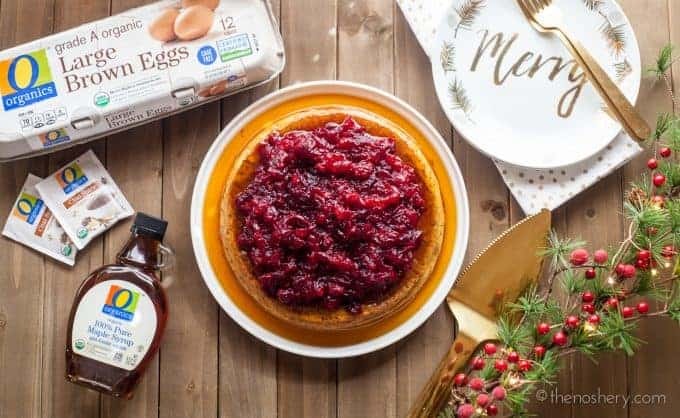 So, not only does Tom Thumb grocery delivery save you time but how awesome is it to have certified organic and grass fed products delivered to your door? 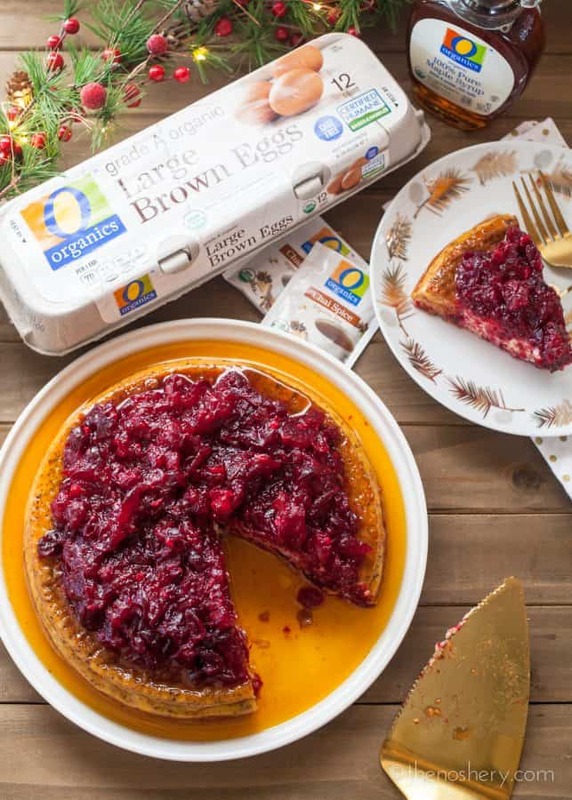 The O Organics line offers USDA certified organic products such as eggs, dairy, chicken, beef, and more. If grass fed is your main concern Open Nature offers premium grass-fed, free-range, and natural beef that is vegetarian fed and free of antibiotics or added hormones. All perfect for easy weeknight favorites to holiday show-stoppers. O Organics and Open Nature products are available in my area exclusively at Tom Thumb and Albertsons, and you can also find them at all Albertsons family of grocery stores, including ACME Markets, Jewel-Osco, Vons, Pavilions, Safeway, Shaw’s, Star Market, United Express, United and Carrs/Safeway. Wishing you and your loved ones a merry and stress-free holiday season! Need more Puerto Rican recipes? Check out my full collection of Puerto Rican recipes! 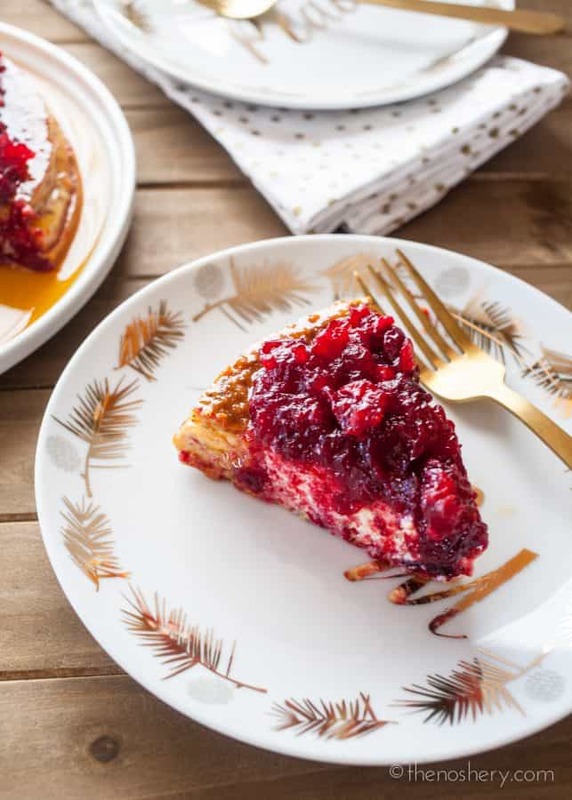 Creamy cheese flan spiced with chai and orange and then topped with a sweet and tart cranberry compote. Have cake pan out and ready. Heat sugar in a small pot over medium-high heat. Let sugar sit for about 2 minutes until sugar begins to melt. Be sure to keep an eye on the sugar. Once the sugar begins to melt, swirl the pot. Continue to periodically swirl the pot until sugar melts smooth, careful not to over brown the sugar. Immediately pour caramel into round cake pan, evenly coating the bottom of the pan. You will have to move quickly before the caramel sets. 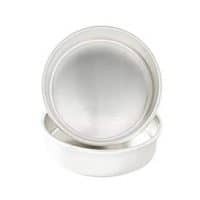 Set pan aside until ready to use. Add cream cheese and 2 tablespoons of evaporated milk to the bowl of a stand mixer. With a whisk attachment, whisk the cream cheese and milk until smooth. Add in eggs one at a time. Mix in evaporated milk, sweetened condensed milk, orange zest, chai tea leaves, and vanilla. Pour batter into prepared cake round. Place flan into a large roasting pan in the oven and pour water into the roasting pan outside of the cake pan until the water covers the flan halfway. Bake for 1 hour or until set. While the flan bakes prepare the cranberry sauce. In a large saucepan, combine the cranberries and orange juice bring to a simmer over moderate heat. Cover and cook over moderately low heat, stirring occasionally, until the cranberries have popped, about 10 minutes. Add both sugars, ginger and orange zest and cook over moderate heat, stirring occasionally, until thick, about 5 minutes. Let cool and store until ready to use. Let flan cool on the counter top for 30 mins and place in the refrigerator to cool for 4 hours or overnight to cool completely. Run a knife along the edge of the pan and carefully invert onto a large rimmed platter. 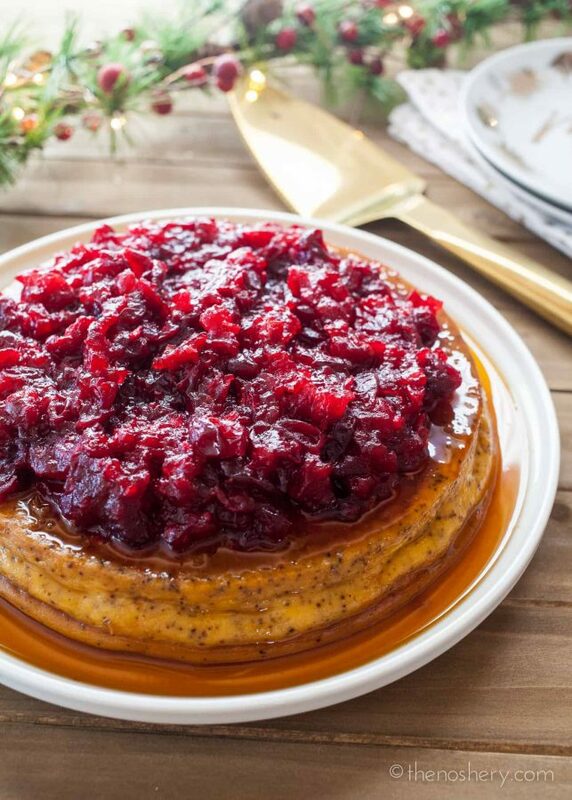 Top with cranberry compote and enjoy. Be sure that all your ingredients are room temperature. If you mix cold eggs in with the cream cheese it will lump. Taking the steps to beat the cream cheese with 2 tablespoons of milk will ensure a smooth creamy texture. Cooling the flan in the refrigerator helps with the caramel sauce. How do you make the traditional cheese flan?